There are an extensive number of extraterrestrial races known to be currently interacting with Earth and the human population. In a 1998 interview, Clifford Stone, a retired US army Sergeant who served in the US Army for 22 years and participated in covert operations to retrieve crashed extraterrestrial ships and extraterrestrial biological entities (EBE's), revealed there were a total of 57 extraterrestrial races known to the US military. From this pool of extraterrestrial races, a number are more active than others, and can be claimed to have the most significance for human evolution and sovereignty. The extensive number of reports and testimonies concerning different extraterrestrial races indicates that the motivations and activities of extraterrestrial races vary greatly, and an idea of these motivations can be distilled from close examination of these reports and testimonies. The most compelling testimonies on the different extraterrestrial races comes from 'whistleblowers' such as Sergeant Stone who served for long periods in the military and/or corporations participating in 'black projects'; and 'contactees' in a broad sense of those who have had direct physical contact with extraterrestrials and communicated with them. This includes both 'contactees' in the classic sense of those who have voluntarily interacted with extraterrestrial races, and 'abductees' who have been involuntarily incorporated into extraterrestrial programs. I will first refer to some of the main sources of information for different extraterrestrial races generally operating on Earth, and then attempt to make specific descriptions about the motivations and activities of these races using available sources. While there may be considerable debate over the accuracy of the information provided by the whistleblowers and contactees presented in this report, I have argued elsewhere that 'whistleblowers' and 'contactees' provide the strongest evidentiary sources for the extraterrestrial phenomenon. What further helps in supporting the reliability of the information provided by these 'whistleblowers' and 'contactees' is the consistency and coherence of the testimonies and evidence provided by them, and ultimately the credibility of the individuals involved. Consequently, this report will focus primarily on the testimony on a select number of 'whistleblowers' and 'contactees' whose consistency, coherence and credibility suggest they are providing reliable information on the motivations and activities of different extraterrestrial races. On February 20, 1954, a delegation of 'human looking' extraterrestrial races met with the Eisenhower administration in an unsuccessful effort to reach an agreement on the US's thermonuclear nuclear weapons program. The apparent stumbling block was that these extraterrestrial races were not willing to provide technology that might be used by the military-industrial interests that dominated the Eisenhower administration and set the tone for subsequent extraterrestrial - human dialogue. The principled opposition of this group of extraterrestrials to being co-opted into an emerging military-industrial-extraterrestrial complex (MIEC) marks an important indicator of a large grouping of 'human' extraterrestrial races who lie outside of the web of interlocking interests that make up the MIEC in the US and elsewhere on the planet. There are two parts to this grouping of extraterrestrials. The first are 'extraterrestrials' that have historically inhabited the Earth's subterranean dwellings, and are described as remnants of ancient human civilization that followed a separate evolutionary path to surface humanity. The second are extraterrestrials that have 'off-world' origins but have humanoid features to the extent that some of them can easily intermingle with the rest of humanity without being easily identified. While there continues to be controversy over the veracity of Admiral Byrd's diaries, there are a number of reported encounters with representatives of an advanced subterranean human race. A large subterranean city called Telos is argued to lie below Mt Shasta, California and has been described by individuals who have either physically traveled to this city and witnessed it, or those who claim to have telepathically communicated with the occupants of this city. Prominent UFO researcher, William Hamilton, claims to have met representatives of Telos who described to him the advanced technology and structure of Telos and their connection to the former civilization of Lemuria. The 'off-world' human looking extraterrestrial have been claimed to have provided some of the genetic material for human evolution, and that many of these extraterrestrials have allowed some of their personnel to incarnate as 'star seeds' on Earth in human families. These 'star seeds', 'star children' or 'star people' are described by Brad and Francie Steiger as individuals whose 'souls' were formally incarnated on the worlds of other star systems and then traveled to Earth and decided to incarnate here in order to boost the evolutionary development of humanity. Most of humanity would consider this group of extraterrestrials to be 'benevolent' as described by 'contactees' such as George Adamski, Orfeo Angelucci, George Van Tassell, Howard Menger, Paul Villa, Billy Meier and Alex Collier who each explain the nature of their voluntary interactions with these human looking extraterrestrials. These contactees often provide physical evidence in the form of photographs, film and/or witnesses of their contacts with extraterrestrial races. The most extensively documented and researched contactee is Eduard 'Billy' Meier who provided much physical evidence for investigators. These off world human extraterrestrial races appear to have different 'specialties' as a result of unique histories and planetary migrations due to galactic upheavals and conflicts. It is worth exploring the main activities of each race to understand how they either currently interact with humanity or how they may better interact with humanity to address global problems. Comprehensive investigations by a number of individuals and organizations found that Meier's evidence was not fabricated and therefore constituted significant support for his testimony of extraterrestrial contact. Due to the amount of physical evidence he had provided over the years, Meier has gained great credibility, and the consistency and coherence of his testimonies suggest that he is indeed an important spokesperson for an extraterrestrial race. The Andromedans' chief activity appears to be facilitating decisions of the Galactic community in dealing with difficult problems such as the current Earth situation, innovative strategies for resolving conflict, and the education of youth. 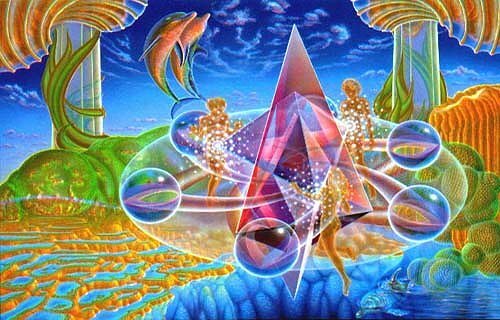 The global solutions they promote include assisting the growth of psychic/crystal/rainbow children, peace education, exposing elite manipulation, promoting improved global governance, and diplomacy and conflict resolution. While it cannot be known exactly how influential the Ummites assistance has been since it was largely covert, it certainly appears to have been significant in sparking innovative scientific initiatives by range of technically competent professionals and private citizens. It can be concluded that the Ummite's main activity lies in sharing technical information, transforming scientific culture, and global education. The Ummites can assist in global solutions surrounding the transformation of scientific paradigms, development of environmentally friendly technologies, and educational reform. Lyrans (Lyra) Disseminating the unique history of the human race in the galaxy, and assisting in the understanding human motivations and potentials. Tau Cetians (Tau Ceti) Exposing ET subversion & control, identifying corrupt elites & institutions, uplifting human consciousness, negating ET mind control and dealing with militarism. Andromedans (Andromeda) Facilitating decisions of the Galactic community in dealing with the current Earth situation, innovative strategies for resolving conflict, & the education of youth. (Sirius A) Assisting in building a suitable ecological system for (human) evolution on Earth by altering the 'bio-magnetic energy grid' of the planet.